“You know, when I retire, I’ll . . .” How would you fill in the rest of that sentence? For some people, it means having more time for a beloved hobby or to take time to travel. For others, it’s being at home with the grandkids or an opportunity to volunteer in the community. Whatever your answer is, a good retirement takes planning and the best tie to start is long before it’s time to retire. 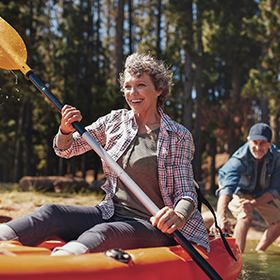 Here are three ways to ensure your retirement years are satisfying, and the one thing you need to do to make that happen. Actually, this is something that improves your quality of life at any age. Taking care of your health when you’re young and in middle age lays the foundation for a healthy retirement. You know the drill here: Don’t smoke. Eat healthy food. Be physically active. Being in good health is especially important in retirement because, even with Medicare, you will have health care expenses. In the 2017 Transamerica Center for Retirement Studies survey, 32% of respondents named high health care expenses as one of their retirement fears. According to the Department of Health & Human Services, two-thirds of Americans turning 65 in 2017 will need long-term care at some point. This is one area where it pays to plan ahead. Long-term care insurance is much less expensive if you get a policy while you are in your 50s or even younger. Having long-term care insurance protects you, to a point, from the high cost of long-term care. The Genworth annual cost of care survey found that the average cost of assisted living is $3,628 per month; while care in a skilled nursing facility averages $6,844 per month for a semi-private room. Increasingly, long-term care is needed because of the rising rate of cognitive decline, including Alzheimer’s disease and other forms of dementia. Today, 5.4 million Americans live with Alzheimer's disease, but that number is expected to climb to 7.1 million by 2025. The cost of health care, long-term care, and hospice care for these patients is estimated at $236 billion per year. There also is a human cost to these conditions on spouses, family members, and friends who provide care. According to the Alzheimer’s Association, Americans dedicated 18.1 billion hours to caring for people with that disease. This too, could become part of your retirement years. It is important to talk with your family about your fears and choices should you develop one of the dementia conditions. This can make it easier for you all to cope with the disease should it happen. This goes beyond the importance of remaining physically and mentally active that is discussed above as part of staying healthy. There is real benefit to staying active out in the world around you. This can take many forms: volunteering, joining clubs or civic groups, getting involved with your place of worship. For people with families, retirement will expand the time you have to participate more actively in the lives of your children, grandchildren, nieces, and nephews. Chances are you have a lot of wisdom and experience to share. And never forget the blessing of simply being there to comfort and encourage. An increasing number of Baby Boomer retirees are choosing not to retire in the traditional sense. They are working part-time or starting businesses based on something that interests them – selling watercolors on Etsy or silver napkin rings on EBay, for example. In other words, you have the power to create your own retirement, on your own terms. put together a sample budget. It should cover your fixed costs (rent or mortgage, taxes, groceries, utilities) and discretionary expenses (travel, gifts, meals out, mani-pedis, gold club fees, donations to favored nonprofits). As discussed above, be sure to include health care costs as part of your expenses. A recent study published by Fidelity Investments estimated that the average couple will need nearly $245,000 during retirement to pay for out-of-pocket medical costs not covered by Medicare or supplemental insurance. As you make this list consider where you want to retire. A dollar goes farther in some places than others. An analysis done by CNBC showed that you could live 25 years on $1 million dollars in Michigan, but only 16 in California. Once you have a budget, make a plan to save the amount you will need. This may be a good time to consult with a financial or retirement planner, or there are online templates to get you started. 4.) Save early, save regularly. This is the piece that makes staying healthy, active, and wealthy in retirement possible. And you have to start doing it as early in your life as possible. While nearly one-third of American households own an IRA, ownership rates begin to climb at age 45, reaching 35% among households headed by individuals aged 45 to 54. Ownership increases even more steeply among people aged 55 to 64, reaching 69%. The longer you are saving, the more years your savings have to grow in value. When you open a self-directed IRA, you gain another benefit: You are in control of the type of assets you own in your IRA. These can range from real estate to precious metals, assets that most banks and brokerage houses do not allow. The Entrust Group makes it easy to open a self-directed IRA online in less than 10 minutes. Get ready for your satisfying retirement by opening an account today.